As Asteroids (from Greek ἀστήρ, aster "star " and the ending - statutory "similar" ), minor planets or planetoids are called small objects that move on kepler between orbits around the sun, larger than meteoroids, but they are smaller than dwarf planets and in Unlike comets near the Sun, do not outgas. So far, 638 546 Asteroids in the Solar System known (as of April 5, 2014 ), the actual number is probably in the millions. However, only few of them have more than a few 100 miles in diameter, so that they accept due to their own gravity a round shape and then count to the dwarf planet. Large asteroids in the asteroid belt are the objects ( 2) Pallas, (3) Juno, (4) Vesta, ( 5) Astraea, (6 ) Hebe, (7 ) Iris, (10 ) and Hygeia (15 ) Eunomia. The term asteroid is related to the size of the objects. Almost all of them are so small that they appear in the telescope as the light spot of a star. The term minor planet or planetoid is because the objects are moving in the firmament like planets relative to the stars. Asteroids are no planets and are not considered as dwarf planets, because due to their small size, gravity is too low to form it almost into a ball. Together with comets and meteoroids are asteroids to the class of small body. Meteoroids are smaller than asteroids, but between them and asteroids there is neither the size nor the composition to create a unique border. Since the 26th General Assembly of the International Astronomical Union ( IAU) and their definition of 24 August 2006 are the large round objects whose shape is in hydrostatic equilibrium, strictly speaking, no longer to the asteroid, but to the dwarf planet. ( 1) Ceres ( 975 km diameter) is the largest object in the asteroid belt and is now counted among the dwarf planet. Other large objects in the asteroid belt, which probably include the dwarf planets, are ( 2) Pallas (up to 582 km in diameter) and ( 4) Vesta ( up to 560 km). In Kuiper Belt, there are next to the - formerly known as Planet and now classified as a dwarf planet - Pluto ( 2390 km diameter) further dwarf planet ( 136199 ) Eris ( 2326 km ), ( 136472 ) Makemake (about 1800 km ), ( 136 108 ) Haumea (about 2200 × 1100 km ) ( 90482 ) Orcus ( 1600-1800 km ) and (50000) Quaoar (1250 km). The end of 2003, beyond the Kuiper belt discovered about 1700 km large object ( 90377 ) Sedna should also be classified as a dwarf planet. Already in 1760 the German scholar Johann Daniel Titius developed a simple mathematical formula ( Titius - Bode series), according to which the distances of the planets are a ratio is. However, the series contains a gap, since ( Astronomical Unit ), a missing planet between Mars and Jupiter, at a distance of 2.8 AU. End of the 18th Century began a veritable hunt on the undiscovered planet. For a coordinated search the Himmelspolizey was founded in 1800, the first international research projects, organized by Baron Franz Xaver von Zach, who was then working at the observatory Gotha. The starry sky was divided into 24 sectors, which were systematically searched by astronomers throughout Europe. For the planet had already let the name " Phaeton " book. The search was unsuccessful insofar as the first asteroid ( Ceres ) was discovered at the beginning of 1801 by accident. However, the Himmelspolizey soon proven in several ways: with the finding of a lost minor planets, with improved communication about heaven discoveries and the successful search for other minor planets 1802-1807. On New Year's night of 1801, the astronomer Giuseppe Piazzi discovered and theologian in the telescope of the observatory of Palermo ( Sicily) in the screening of the constellation Taurus a faint star that was not recorded on any star map. Piazzi had heard of Zach's research projects and observed the star during the following nights, as he suspected, to have this planet found. He sent his observation results to Zach, where he first described the object as a new comet. Piazzi fell ill, however, and could not continue his observations. Until the publication of his observations Much time passed. The celestial body was now moved further towards the sun and could not be recovered first. The mathematician Gauss had, however, a numerical method developed (using the method of least squares), which allowed the orbits of planets and comets made ​​to determine only a few positions. After Gauss had read the publications Piazzi, he calculated the orbit of a celestial body, and sent the result to Gotha. Heinrich Wilhelm Olbers spotted the then 31 December 1801, which eventually was named Ceres. In 1802, Olbers discovered another celestial body, which he named Pallas. 1803 Juno was discovered in 1807 Vesta. Until the discovery of the fifth asteroid, Astraea in 1845, but passed 38 years. Nevertheless, the asteroids discovered until then had not yet been designated as such - they were considered to be full-fledged planet. So it was that the planet Neptune was not counted as eighth, but as three tenth planet in its discovery in 1846. As of 1847, however, followed as quickly further discoveries that was soon decided to introduce a new object class of celestial bodies for the numerous, but all quite small celestial bodies that orbit the sun between Mars and Jupiter: the asteroids, the so -called small planet. The number of large planets thus dropped to eight. By the year 1890 more than 300 asteroids were discovered. After 1890, the introduction of photography brought significant advances in astronomy. The asteroids that were previously tedious with sky cards found by the comparison of telescopic observations, now betrayed themselves by light traces on the photographic plates. The higher in comparison to the human eye, light sensitivity of photographic emulsions extremely faint objects could be detected. Through the use of new technology, the number of discovered asteroids increased rapidly. The introduction of the CCD camera technology in 1990 and possibilities of computer-aided analysis of electronic recordings represented another major advance. Since then the number aufgefundener annually asteroid has multiplied tenfold, what programs, such as LINEAR have significant share. If an asteroid's orbit has been determined, the size of the celestial body from the study of its brightness and retroreflectivity, the albedo can be determined. To measurements performed in the optically visible light and in the infrared range. This method is associated with uncertainty, since the surfaces of asteroids are composed chemically different and reflect the light to different degrees. More accurate results can be obtained by means of the radar observations. These radio telescopes can be used, which, converted as transmitters that emit strong radio waves in the direction of the asteroid. By measuring the transit time of the reflected waves from the asteroid whose exact distance can be determined. The further evaluation of the radio waves provides data on the form and size. Control rights " radar images " provided, for example, the observation of the asteroid ( 4769 ) and Castalia ( 4179 ) Toutatis. The Galileo spacecraft flew by asteroid (951) Gaspra and 1993 (243 ) Ida past on their way to the planet Jupiter in 1991. 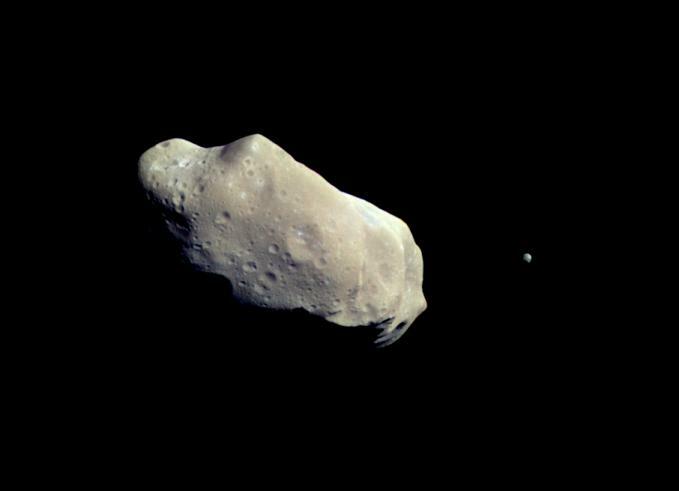 The probe NEAR Shoemaker happened in 1997 the asteroid (253 ) Mathilde and ended in 2001 ( 433 ) Eros. The probe Deep Space 1 in 1999 approached the asteroid ( 9969 ) Braille up to a distance of only 28 km. The Stardust spacecraft moved 2002 3300 km distance to the asteroid ( 5535 ) Anne Frank over. The Japanese probe Hayabusa 2005 reached the asteroid ( 25143 ) Itokawa and took the first rock samples from an asteroid. In June 2009, they dropped a capsule with these samples over Australia. In November 2010, JAXA confirmed that the samples - about 1,500 mostly very small particles - definitely came from the asteroid. The European Rosetta probe passed in 2008 the asteroid ( 2867 ) Steins and 2010 the asteroid (21 ) Lutetia. From July 2011 to September 2012, the Dawn spacecraft was launched in 2007 in orbit around ( 4) Vesta. Subsequently, the spacecraft made ​​its way to the dwarf planet Ceres, which it is to reach 2015. In the near future, the number of known asteroids Pan - STARRS and LSST will again increase dramatically, because for the next few years a number of different surveys are planned with increased sensitivity, for example, Gaia. But the spacecraft GAIA will discover up to one million previously unknown asteroids by model calculations. The names of the asteroids are composed of a prefix number and a name. The number used to line the order of discovery of the celestial body. Today it is a purely numerical Zählform, as it is only awarded if the orbit of the asteroid secured and the object is retrievable at any time; that may well take place until years after the Erstbeobachtung. Of the known 638 546 390 514 asteroids have a number (as of April 5, 2014 ). The discoverer has within ten years after numbering the right of proposal for the award of a name. However, this must be confirmed by a Commission of the IAU, as there are guidelines for the names of astronomical objects. Accordingly, although many asteroids exist with number but no name, especially in the upper ten thousands. New discoveries could be calculated for the no train with sufficient accuracy are marked with the discovery year and a combination of letters, for example, 2003 UB313. The character string composed of the first letters for the half of the month (starting with A and continuously to Y without I) and a continuous characters (A through Z excluding I) together. If more than 25 minor planets are discovered in a fortnight - what is the rule today - starts the letters from the front, each followed by a per barrel increased by one order number. The first asteroid was discovered in 1801 by Giuseppe Piazzi at the observatory of Palermo in Sicily. Piazzi christened the celestial body on the name " Ceres Ferdinandea ". The Roman goddess Ceres is the patron saint of the island of Sicily. The second name was Piazzi King Ferdinand IV, honor the ruler of Italy and Sicily. This displeased the international research community and the second name was dropped. The official name of the asteroid is, therefore, ( 1) Ceres. In the further discoveries, the nomenclature has been retained and the asteroids were named after Roman and Greek goddesses; These were ( 2) Pallas, (3) Juno, (4) Vesta, ( 5) Astraea, (6 ) Hebe, and so on. As more and more asteroids were discovered, astronomers went from the ancient deities. So asteroids were, among others, by the wives of the discoverer, named in honor of historical figures or public figures, cities and fairytale characters. Examples include the asteroid (21 ) Lutetia, (216 ) Cleopatra ( 719) Albert, (1773 ) Rumpelstiltskin ( 5535 ) Anne Frank ( 17744 ) Jodiefoster. Moons of asteroids get their name not a permanent number and does not apply as asteroids and small bodies, as they do not own orbit the sun. First, astronomers assumed that the asteroids are the result of a cosmic catastrophe, in which a planet between Mars and Jupiter broke apart and fragments left in its path. It was found, however, that the total mass present in the main belt asteroids is very much less than that of Earth's moon. Estimates of the total mass of the minor planets vary from 0.1 to 0.01 percent of the mass of the Earth ( The Moon has about 1.23 percent of Earth's mass ). Therefore, it is assumed today that the asteroids represent a residual population of planetesimals from the formation of our solar system. The gravity of Jupiter, its mass grew fastest, prevented the formation of a larger planet from the asteroid material. The planetesimals were disturbed in their orbits, collided violently with each other again and again and broke. One part was deflected onto paths that brought them on a collision course with the planet. Of these, still bear witness to the impact craters on the planet 's moons and the inner planets. 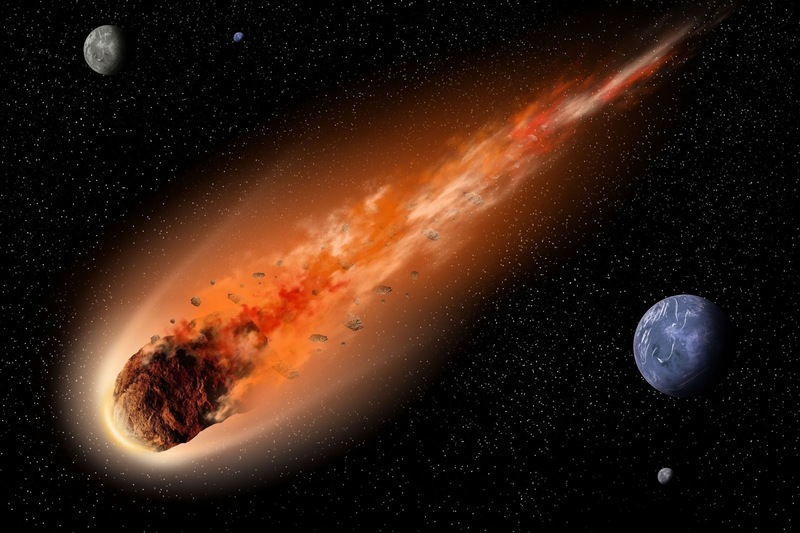 The largest asteroids were heated strongly (mainly by the radioactive decay of aluminum - isotope 26Al and possibly also of the iron isotope 60FE ) melted after its creation and in the interior. Heavy elements, such as nickel and iron, are added from a result of the action of gravity in the interior, the lighter compounds such as silicates, remain in the outer regions. This led to the formation of differentiated bodies with metallic core and silicate mantle. Part of the differentiated asteroid broke in further collisions with fragments that fall into the domain of attraction of the earth, come down as meteorites. The spectrum of the A- asteroids shows significant Olivinbanden and points to a completely differentiated cladding region. A- asteroids hold up in the inner region of the main belt. Examples would be (446 ) Aeternitas ( 1951) and Lick ( 1747 ) Wright. Similar in the C and G-Class. Deviations in the UV range. Examples: (62 ) Erato, (2) Pallas, (3200) Phaethon are B- asteroids. This is with a share of 75 percent of the most common type asteroids. C asteroid have a carbon- or carbon -like (the C is carbon ) with a dark surface albedo to 0.05. It is believed that the C- asteroids of the same material as the carbonaceous chondrites, a group of stone meteorites. The C asteroids move in the outer region of the main belt. (54 ) Alexandra, (164 ) and Eva ( 2598 ) Merlin are representative of this spectral type. This type is similar in the P- asteroids, with a low albedo and a reddish spectrum. Examples are ( 3552 ) Don Quixote (435) Ella, ( 944 ) Hidalgo. The surfaces of this rare type of asteroid composed of the mineral enstatite. Chemically, they are likely to be similar to the enstatite chondrites, a group of stone meteorites. E- asteroids have a high albedo of 0.4, and more. Examples: (29075) 1950 DA, (33342) 1998 WT24, (64 ) Angelina ( 2867 ) Šteins. Also a subset of the C-Class, but with differences in the UV range. In addition, absorption lines are missing in the wavelength range of the water. Examples: (704 ) Interamnia, ( 1012) Sarema, (530 ) Turandot. These can be viewed as a subset of the C-Class, as they have a similar spectrum, but in the UV region have different absorption lines. Examples: (106 ) Dione (130 ) Elektra, ( 19) Fortuna. The vast remainder of the asteroid is attributed to this type. In the M- meteorites ( the M stands for metallic) should it act nuanced to the metal-rich cores asteroids that were smashed in the collision with other celestial bodies. They have a similar albedo as the S- asteroids. Their composition is likely the same nickel - iron meteorites. (250) Bettina, (325 ) Blueberry Hill, (224 ) Oceana (16 ) Psyche and ( 498 ) Tokyo are M- asteroids. Asteroids of this type have a very low albedo and a spectrum in the reddish area. You are probably composed of silicates with carbon contents. P asteroids hold off on the outer region of the main belt. Examples: (65 ) Cybele, (76 ) Freia, (1001 ) Gaussia, (46 ) and Hestia ( 643 ) Scheherezade. This type is similar to the V- asteroid. The spectrum indicates high proportions of olivine and pyroxene. Example: ( 349 ) Dembowska. The second most common with a share of 17 percent type ( the S stands for silicate) occurs mainly in the inner region of the main belt. S- asteroids have a brighter surface with an albedo of 0.15 to 0.25. Terms of their contents, they resemble ordinary chondrites, a group of stony meteorites, which are mainly composed of silicates. Examples: (29 ) Amphitrite, ( 5) Astraea, (27 ) Euterpe, (6 ) Hebe, (7 ) Iris. T- asteroids are found in the central and outer region of the main belt and in the Jupiter Trojans. They have a dark reddish spectrum, however, differ from the P- and R- asteroids. Examples: (96 ) Aegle, ( 3317 ) Paris, ( 308) Polyxo, ( 596) Scheila. 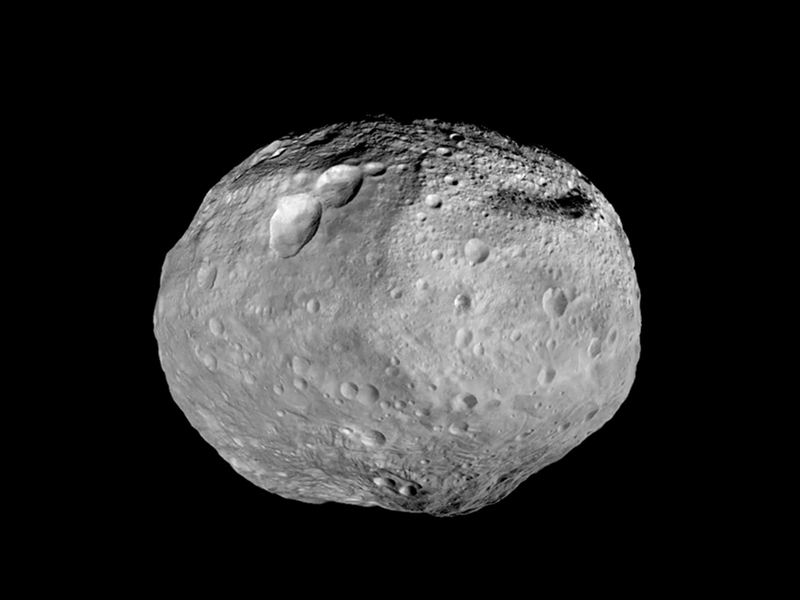 This rare type of asteroid ( the V stands for Vesta ) is similar in the S- asteroids. The only difference is the increased proportion of pyroxene minerals. It is assumed that all V- asteroid come from the silicate mantle of Vesta and were blown off in the collision with another asteroid. It has a huge impact crater to the asteroid Vesta. Found on Earth HED- achondrites, a rare group of stony meteorites, could also originate from Vesta, since they have a similar chemical composition. Examples of V- asteroid: ( 4055 ) Magellan ( 3908 ) Nyx ( 3551 ) Verenia. Asteroids with reddish spectra which can not be precisely classified in the classes E, M or P, because the necessary albedo provisions are not met. Examples: (53319) 1999 JM8, ( 3362 ) Khufu, (275 ) Sapientia (1604 ) Tombaugh. In the past, scientists assumed that the asteroid monolithic boulders, that are compact structures. The low densities of several asteroids and the presence of giant impact craters, however, suggest that many asteroids are built loose and are more likely to be regarded as rubble piles, as loose " rubble pile ", which are held together only by gravity. Loosely structured body can absorb the forces occurring in collisions without being destroyed. Compact body, however, for larger impact events torn apart by the shock waves. Moreover, the asteroid only low rotation speeds. A rapid rotation around its own axis would otherwise cause the centrifugal forces tear the body apart ( see also: YORP effect). 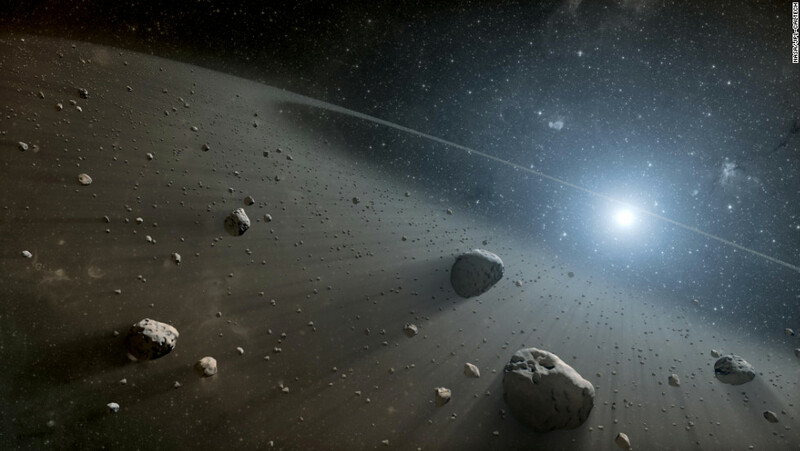 It is now believed that the vast majority of the 200 -meter asteroids are such cosmic rubble. Unlike the planets, many asteroids do not have nearly circular orbits. You have, apart from most main belt asteroids and the cubewanos in the Kuiper Belt, mostly very eccentric orbits whose planes are inclined in many cases strongly against the ecliptic. Their relatively high eccentricities make them train cruisers; these are objects that pass through the paths of one or more planets during their circulation. However, the gravity of Jupiter ensures that moving asteroids, with a few exceptions, only work within or outside its orbit. Within the orbit of Mars to move several different asteroid groups, made all with a few exceptions from objects of less than five kilometers size ( but mostly much smaller ). Some of these objects are Mercury and Venus railway cruisers, of which several are moving just inside Earth's orbit, some of them can also be ticked. Again, while others move just outside the Earth's orbit. The existence of the group of asteroids known as Vulkanoiden could not yet be detected. These asteroids are to move on orbits within the solar neighborhood of Mercury. Asteroids whose orbits come close to Earth's orbit are known as near-Earth asteroids. Usually, as a criterion of demarcation perihelion less than 1.3 AU used. Because of a theoretical risk of collision with the Earth is searched systematically for several years after them. Major search programs include Lincoln Near Earth Asteroid Research (LINEAR ), the Catalina Sky Survey, Pan - STARRS, NEAT and LONEOS. The objects of this type asteroids cross the orbit of Mars toward Earth. However, they do not cross the Earth's orbit. A representative is discovered in 1898 ( 433 ) Eros, the Earth's orbit approaches to 0.15 AE. Near Gone transitions from Eros to Earth were in the years 1900 and 1931 for the precise measurement of the solar system. The namesake of the group, who discovered 1932 (1221) Amor, has a typical path from 1.08 to 2.76 AE. The largest member of this group is 38 kilometers in diameter asteroid ( 1036 ) Ganymed. All asteroids of the Amor - type have their perihelion in relative perigee, but their aphelion, both within the orbit of Mars and far beyond the orbit of Jupiter. These objects belong to a subgroup of the Aten - type whose aphelion is within the Earth's orbit and thus these do not cross ( Aten asteroids have their aphelion typically outside the Earth's orbit ). These are objects whose orbit crosses that of Earth, which includes the likelihood of a collision. About 90 percent of known asteroids move between the orbits of Mars and Jupiter. For you to fill the gap in the Titius - Bode series. The largest objects are here ( 1) Ceres, (2) Pallas, (4) Vesta and (10) Hygiea. After Ceres has been given the status of a dwarf planet, this classification is still being researched and considered according to the criterion of hydrostatic equilibrium with the other. This zone is defined by the 4:1 - limited and 3:1 resonance is between about 2.06 and 2.5 AU and usually contains silicate- rich asteroids of the V- and S-Class. Objects in this group have semi-major axes from 2.5 to 2.8 AU. There dominate asteroid C-type. Also, the dwarf planet Ceres moves in this zone, which lies between the 3:1 resonance ( Hestia gap) and the 5:2 resonance. This area is limited to the outside of the Hecubalücke (2:1 resonance ) at about 3.3 AU. In this range occur frequently objects D and P class. Between the planets Jupiter and Neptune is a designated as a centaur group moves from asteroids on eccentric orbits. The first representative was discovered ( 2060 ) Chiron. The Centaurs probably originate from the Kuiper belt and are deflected by gravitational disturbances on unstable orbits. A group of objects ( 5335 ) Damocles was named after the asteroid. They have their aphelion usually beyond the orbit of Uranus, but a perihelion in the inner Solar System. Your comet-like orbits are very eccentric and highly inclined to the ecliptic. Your circulation is declining in some cases. The known objects are about eight kilometers in size and resemble cometary nuclei, but have neither Halo nor tail. The orbits of these objects are in resonance with Neptune. The best known representatives are the Plutinos to which the dwarf planet ( 134340 ) Pluto and ( 90482 ) Orcus belong. These objects move in nearly circular orbits with inclinations below 30 ° at a distance 42-50 AE around the sun. Known representatives are ( 20000) Varuna and (50000) Quaoar. Celestial bodies of this group have very eccentric orbits whose aphelion can be in up to 1000 AU distance, while the perihelion is usually at 35 AU. Part of this group is the largest known dwarf planet ( 136199 ) Eris. Asteroids that are in the Lagrange points of the planets are called " Trojan". First, these companions were discovered at Jupiter. They move to the orbit of Jupiter before or behind the planet. Jupiter Trojans are for example ( 588 ) and Achilles ( 1172 ) Aeneas. In 1990 the first Mars Trojan was discovered and named (5261) Eureka. In the following years four more Mars Trojans were discovered. Also Neptune has Trojan. Some asteroids move on a horseshoe orbit to a planet's orbit, such as the asteroid 2002 AA29 near the earth. In the solar system move some asteroids that have the characteristics that they share with no other object. These include, among others ( 944 ) Hidalgo, which moves on a highly eccentric, comet-like orbit between Saturn and the main belt, and (279 ) Thule, which in itself as the sole representative of a potential group of asteroids in the 4:3 resonance with Jupiter 4.3 AE around the sun moves. Another object is ( 90377 ) Sedna, a relatively large asteroid outside the Kuiper Belt has a wide eccentric orbit that removed him up to 900 AU from the Sun. 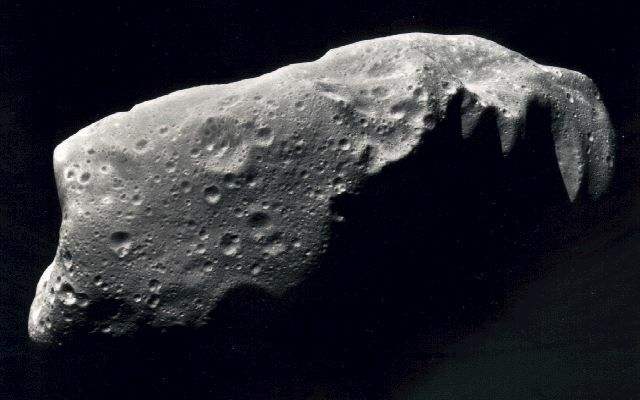 Asteroids that collide with much larger celestial bodies like planets, produce impact craters. The size of the impact crater and the associated energy release (explosion) is largely determined by the speed, size, mass and composition of the asteroid. The trajectories of the asteroids in the solar system are not known accurately enough to calculate the long time whether and when exactly an asteroid on Earth ( or another planet ) will take. By reaching out to other celestial bodies the orbits of the asteroids are constantly smaller changes. Therefore it is not calculated until the risk of impacts based on the known orbital data and uncertainties. It changes continuously with new, more accurate observations. The Turin scale is kept clear and simple. It is divided into integer steps from 0 to 10, where 0 means no risk and stage 10 corresponds to a secure wrap with large global destruction effect. From this scale is rather made ​​in the use of media, as it is easier to understand than the Palermo scale. The Palermo - scale turn is in astronomy frequent use, since it is physically meaningful. It sets the impact probability with the background risk by objects of comparable size in conjunction. The Palermo scale is constructed logarithmic, a value of 0 on the Palermo - scale corresponds to the simple background risk (1 = 100), 1 corresponds to ten times the risk ( 10 = 101 ), 2 100-fold risk ( 100 = 102) and so further. On 18 March 2004 occurred at 23:08 CET clock of Asteroid 2004 FH, a rock fragments with about 30 meters in diameter, the earth over the southern Atlantic Ocean at a distance of only 43,000 kilometers. The only about six feet wide asteroid 2004 FU162 approached the Earth on 31 March 2004 6,535 kilometers. The second largest rapprochement took place on December 19, 2004 2004 Yd5 (5 m diameter) at a distance of 35,000 km. Due to the small size of only a few meters, he would, as in 2004 FU162, are probably considered one of the meteoroids. On 29 January 2008 happened 09:33 clock the asteroid 2007 TU24 CET (250 m diameter ) at a distance of 538,000 kilometers the earth. On 9 October 2008, approximately one meter asteroid 2008 TS26 happened in only 6150 km distance to earth. No other currently known asteroid has come closer to the Earth. On 2 March and 18 March 2009 at 13:17 CET clock the asteroid 2009 DD45 passed ( 21-47 m diameter) and 2009 FH ( 13-29 m) the earth at a distance of only 70,000 or 80,000 km. The two asteroids were discovered the day before. Only 15 hours before its closest approach to Earth astronomers discovered a seven -meter asteroid. The rocks slipped past at a distance of 2 Earth radii on the earth on November 6, 2009. He was tracked down by the Catalina Sky Survey. This ensured the asteroid called 2009 VA, the third largest convergence of all known and cataloged asteroids that are not smashing to the ground. On 13 January 2010 occurred at 13:46 CET clock, the asteroid 2010 AL30 (10-15 m diameter ) at a distance of 130,000 miles up the earth. He was discovered on January 10, 2010 by scientists from MIT. On September 8, 2010, two asteroid passed the Earth: at 11:51 CET clock, the asteroid 2010 RX30 ( 10-62 m diameter ) at a distance of 250,000 kilometers, clock 23:12 CET, the asteroid 2010 RF12 ( 7-16 m diameter ) at a distance of 80,000 kilometers. Both were discovered on September 5, 2010. On 9 November 2011, the 400 m wide asteroid ( 308635 ) 2005 YU55 happened in 324.6 thousand kilometers away - that is, within the moon's orbit - the Earth. On 27 January 2012, the 11 m wide asteroid 2012 BX34 passed at a distance of less than 60,000 km, the Earth. On February 15, 2013, approximately 45 m wide asteroid ( 367943 ) Duende happened at a distance of 28.000 km, the Earth, so still below the orbit of geostationary satellites. On April 13, 2029 270 m large asteroid ( 99942 ) Apophis will pass Earth. According to previous calculations, only about three times Earth's diameter ( about 30,000 km) will be between the Earth and the asteroid. Such an event occurs, according to the University of Michigan only happens once every 1300 years. The asteroid (29075) 1950 DA ( 1.1 km diameter) is of the earth on March 16, 2880 are very close, even the possibility of a collision. The probability is 0.33 percent. A listing of underground craters can be found in the list of impact craters on earth as well as a selection in the article impact crater in paragraph Large and well-known impact craters.